If you're interested in joining our pack, please contact us via the "Contact Our Pack" button above. Each time you complete an accomplishment or learn a new skill, you will be rewarded. Sometimes the reward is a loop for your belt, a pin, or a patch. Sometimes it is a smile on your parents' faces to see you grow and learn. BECOME A CUB SCOUT WITH PACK 860!! Safety is the top priority of scouting in Pack 860. Pack 860 leaders and members strictly adhere to the Boy Scouts of America policy regarding Youth Protection and attend a vigorous training program to ensure that all Pack 860 Cub Scouts are kept safe at all times. Pack 860 Cub Scouts have a LOT of FUN! They go camping, build and race pinewood derby cars, learn how to tie knots, learn archery and many other fun skills. They have overnighters aboard aircraft carriers, camp overnight at Wilderness Park, have scavenger hunts, play games, attend summer camp at Lake Arrowhead, watch and perform skits and much, much more. the more awards they want and the more they want to learn. Cubs are encouraged to verbally present their latest achievements to the Pack thus fostering their public speaking skills and confidence. Performing in skits is another way Cubs become comfortable in front of an audience of their friends. Cub Scouting is fulfilling and enriching. Scouting teaches important values that will last a lifetime. The Cub Scout promise includes ‘doing your best’ and ‘helping other people’. Pack 860 Cub Scouts learn how to put their promise into action. Cub Scouts help others by collecting food, clothing and money to share with the less fortunate. Cub Scouts also learn about nutrition, good eating habits, sports, fitness, leadership, avoiding dangers and so much more. Pack 860 Cub Scouts learn respect for our country by learning about our past and by showing respect for our flag. Cub Scouts learn about America’s heritage, it’s heroes and what makes America special. Cub Scouts learn the Pledge of Allegiance, how to conduct a flag ceremony and the care of our nation’s greatest symbol. Cub Scouts are also encouraged to learn more about their own religious beliefs. Pack 860 Cub Scouts learn about our planet and how to care for it. Pack 860 Cub Scouts participate in Beach Clean Up Day to help keep our local Hermosa Beach waterfront clean and safe. Scouts learn that they are responsible to ‘take only photographs’ and ‘leave nothing but footprints’ when they explore nature. Pack 860 Cub Scouts gain an additional sense of accomplishment for their achievements as they raise money for their programs by harvesting and selling mistletoe, by selling popcorn and through other fundraisers. This also teaches salesmanship and the benefits of hard work. Scouts also learn that preparing and cooking their own meals can be fun. AND LAST BUT NOT LEAST! 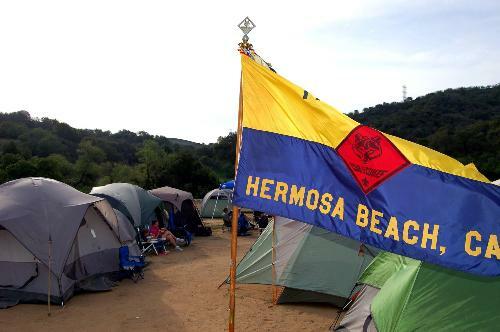 !...Pack 860 Cub Scouts live in Hermosa Beach and scouting allows the Cubs to grow their school-based circle of friends.